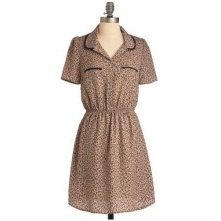 Enjoy your favorite treat while relaxing in this Leopard print frock, which features short puff sleeves, a Peter Pan collar with lacy black trim, and a button-down bodice with decorative faux pockets. This tasteful yet playful shift pairs perfectly with a bright orange cardi, knit stockings, brogues, and a classic adventure film. Indulge in your favorite snack and your favorite style at the same time! Fabric does not provide stretch. Elasticized waist provides approximately 6 inches of stretch. Unlined. Button closure at front. Two decorative pockets at chest.